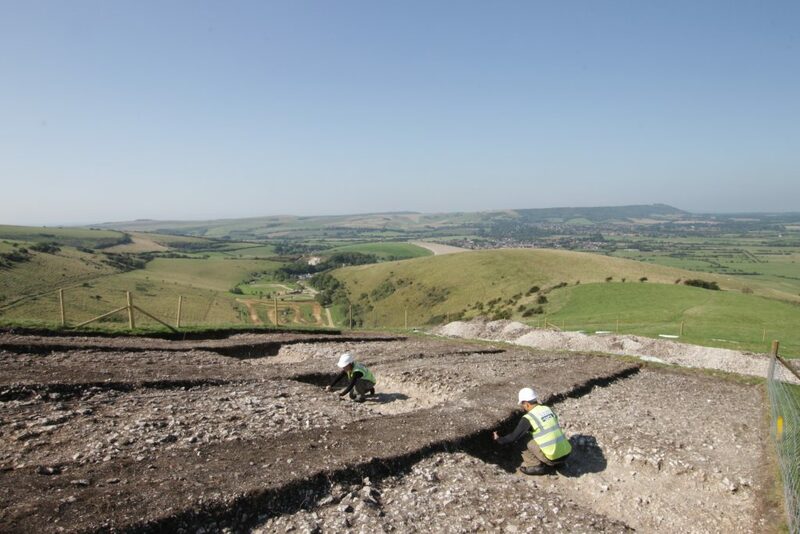 An extensive archaeology programme was undertaken as part of the Rampion onshore cable route construction. This included: a watching brief, with strip, map and sample investigations; full excavations, and geoarchaeological investigations. Previous archaeological investigations, including desk-based assessments and an evaluation trench exercise, had identified a number of zones of potential archaeological importance spanning the Bronze Age to post-medieval periods, as well as zones of geoarchaeological significance. The watching brief and strip, map and sample investigations largely confirmed the results of the evaluation and 18 zones of archaeological activity were recorded. Archaeological remains spanning millennia from the late Neolithic, through to the Bronze Age, Roman, medieval and post-medieval periods were uncovered, and include finds of flint tools, pottery, pits and salt–working and watercress cultivation features. 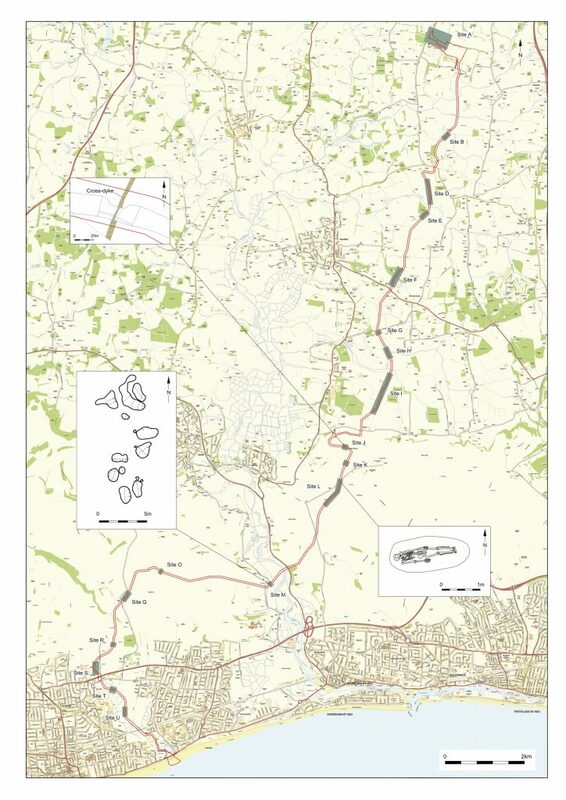 Three case studies of what was found by Archaeology South-East (UCL) are detailed here. All the bones were recovered except a few missing phalanges from hands and feet. 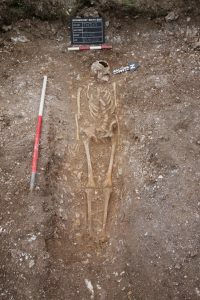 The burial of an adult male,aged 25 to 35 years old, was found in a shallow grave, high on the downs on the south-western side of Truleigh Hill (north of Shoreham-by-Sea). The skeleton was placed in an extended supine position, with the arms placed on the sides of the body. The body was orientated east-west with the head placed at the western end of the grave. No associated finds or remains of coffin or grave furniture were present. The degree of preservation was excellent and all the bones were recovered with the exception of a few missing phalanges from the hands and feet. Evidence of trauma was represented by a well-healed fracture on the left arm, evidence of stress on the vertebrae due to repeated bending, lifting or twisting motions and, most significantly, two cut marks located at the mid length of the neck. These would have been produced by a sharp blade or knife. It is clear that in order for the marks to be made the knife had to cut through all soft tissue of the neck and throat. Obviously this would have proved fatal. 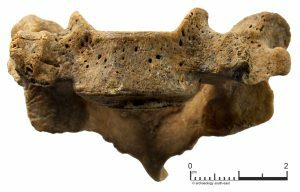 A sample of the human bone from the skeleton was submitted to the US for radiocarbon dating. This indicated a very strong probability that the individual died before the Norman Conquest- during a time known as the Late Anglo Saxon period (earlier 11thcentury AD). The location of the grave and the evidence of a violent death are highly significant. The burial was seemingly isolated, and not located within a formal Christian graveyard, as would normally be expected for this period. The grave was recorded along the ancient route of the South Downs Way, in close proximity to at least two prehistoric burial mounds. The location and nature of the burial indicate that it relates to the execution of the individual due to some crime or misconduct. A programme of Strontium Isotype Analysis will be carried out and it is hoped that further analysis will shed light on where this individual grew up and whether his death played a role in the formation of local territories. A legally protected Scheduled Ancient Monument – a so-called ‘cross-dyke’ – was excavated on Tottington Mount near Edburton. Cross-dykes are substantial linear earthworks, typically between 0.2 kilometres (km) and 1km long, and comprise one or more ditches arranged in parallel, to single or multiple banks. They generally occur in upland situations, running across ridges and spurs, and are recognised on aerial photographs as earthworks or crop marks, or as a combination of both. The evidence of excavation and analogy with associated monuments demonstrates that their construction spans the millennium from the Middle Bronze Age, although they may have been re-used later. Current information favours the view that they were used as territorial boundary markers, probably demarcating land allotment within communities, although they may also have been used as trackways, cattle droveways or less likely, defensive earthworks. The monument comprises a north-northeast to south-southwest aligned ditch, which cuts across the northern slope of a chalk spur. 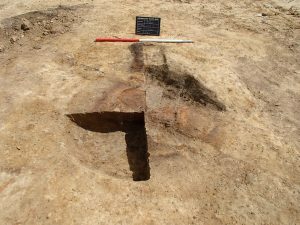 The archaeological work entailed the full excavation of an approximately 45 metre (m) long section of the cross-dyke and revealed that the ditch measured 2.3m wide and 0.48m deep. Cross-dykes are one of the few monument types that illustrate how land was divided up in the prehistoric period. Very few have survived to the present day and hence all well-preserved examples are considered to be of national importance. A number of features were encountered on the River Adur floodplain north-east of Lancing College. An oven or hearth probably related to the medieval salt industry along the River Adur. These had the appearance of ovens or hearths, with intense heat-discolouration evident on their sides and bases and fire-reddened and soot-coloured silt fills. These burnt deposits produced finds of AD 12th century pottery as well as fired-clay, discoloured due to chemical reactions caused by heat and salt. It is probable that this small complex was a so-called ‘saltern’, which were quite common along the tidal parts of the River Adur during the medieval period. Salt would have been a valuable commodity at this time, for use in preservation.